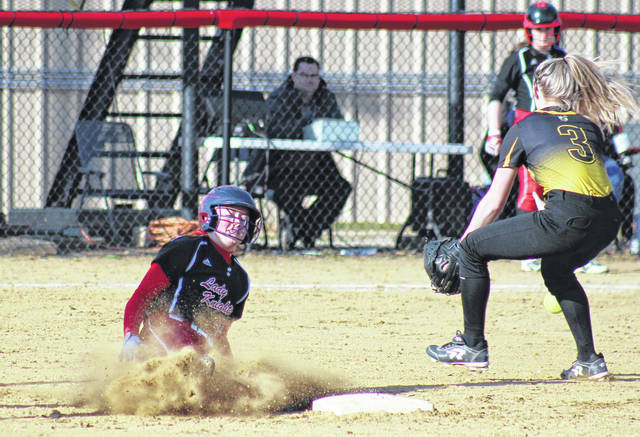 PPHS freshman Hayley Keefer (left) steals second base, during the Lady Knights’ 15-1 victory on Tuesday in Point Pleasant, W.Va.
POINT PLEASANT, W.Va. — Already in the swing of things. 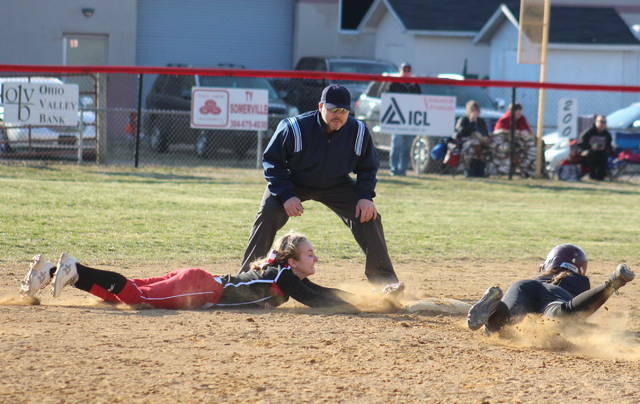 The Point Pleasant softball team started the 2019 season in style on its home field Tuesday night, defeating non-conference guest Williamstown by a 15-1 tally in three innings. The Lady YellowJackets (1-3) led off the game with single, but Point Pleasant (1-0) retired the next three batters in order. The Lady Knights broke the scoreless tie in the bottom of the first inning, as freshman Tayah Fetty tripled home Hayley Keefer with one out. Fetty was left stranded on third, however, as Williamstown escaped the frame with a flyout and a groundout to the shortstop. The guests evened the game with one out in the top of the second, as Alexis Schreckengost scored on a Jocey West single. 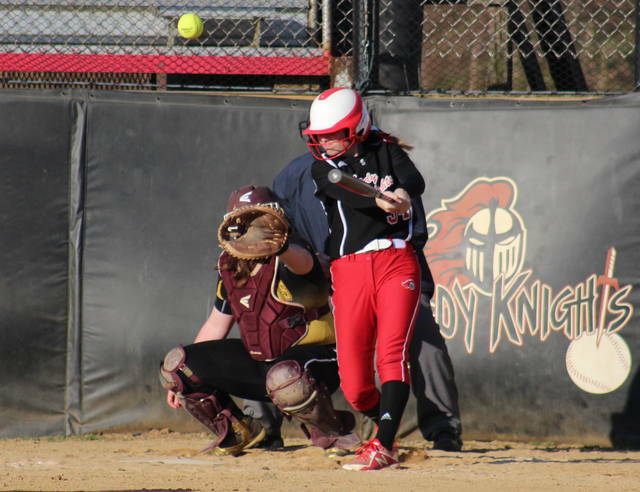 However, the Lady Knights broke the game wide open with 10 consecutive one-out hits in the bottom inning, plating nine runs in the process. Point Pleasant’s 10th run of the frame came on a groundout, and then the hosts added four more runs on four straight two-out knocks. A single and an error gave Williamstown a pair of baserunners in the top of the third, but the guests couldn’t bring either run home and fell by a 15-1 tally. Following the season-opening win, sixth-year PPHS head coach James Higginbotham talked about the Lady Knights’ success on offense, as well as some of the things challenging his young team. 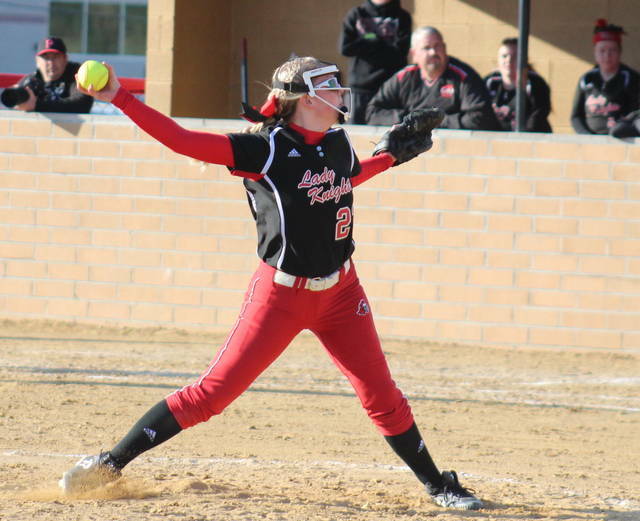 The winning pitcher of record for the Lady Knights was Madilyn Keefer, who allowed one earned run on two hits and a walk in two innings of work. Kyrsten Stroud tossed one frame in relief and surrendered one hit. Both PPHS pitchers picked up a strikeout in the win. Aiyanna Hancock suffered the setback in two innings of work for Williamstown, giving up 15 earned runs on 15 hits and a trio of walks, while striking out two batters. Fetty led the PPHS offense, going 3-of-3 with a triple, a double, three runs batted in and two runs scored. Hayley Keefer was 2-for-2 with a double, three runs and three RBIs, Rylee Cochran was 2-of-2 with a double, one run and two RBIs, while Julia Parsons went 2-for-2 with two runs and one RBI. Emma Harbour had two hits, two runs and two RBIs in the win, while Amber Hatfield added a double, a run scored and two RBIs. Stroud, Peyton Jordan and Hannah Bryant recorded a single apiece for the hosts, with Jordan scoring two runs, Bryant scoring once and driving in two runs, and Stroud crossing home plate one. Brittney Hopper led Williamstown with a 2-for-2 effort, while West was 1-for-1 with an RBI. PPHS committed the game’s lone error and left four runners on base, twice as many as Williamstown. These teams are slated to meet again on April 22 in Wood County. After a trip to Lincoln County on Wednesday, Point Pleasant will be back at home on Thursday to face Parkersburg South.